Poor quality water can cause toxicity problems, disease, pH problems and the blockage of drippers and plumbing. Instead of using your regular water supply you may need to find an alternate source such as rain or bore water, or treat your regular supply using methods such as reverse osmosis. 1. Optimise your choice of water source (see next section). 2. Help decide whether to treat the water before use. 3. Adjust your growing technique. 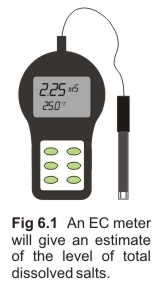 Conductivity (EC) is useful for gauging the total dissolved salt (TDS) content of water (Fig 6.1). The majority of the total salts in natural waters will consist of common salt (sodium chloride), calcium and magnesium bicarbonates, chlorides and sulfates. Sodium and chloride invariably constitute the majority of these salts and they become toxic to plants when present above certain levels. Sulfates, calcium and magnesium are useful plant nutrients. Sometimes they may be present at unnecessarily high (or ‘nuisance’) levels, especially once combined with a full spectrum nutrient formulation which also contains these nutrients - see section below on “hardness”. Bicarbonate is essentially a nuisance salt – see section below on “alkalinity”. - Leaves become scorched around the edges and may wither or die. - Leaves may drop off and shoots die back. Growers should note that many of these symptoms are also indicative of other problems such as a lack of water, disease, malnutrition and excessive light or heat. - Soil or coco (run-to-waste) systems: Ensure the medium provides good drainage. Each watering volume should be sufficient to flush accumulated nuisance salts below the root zone*. This is especially necessary when growing in pots. When using smaller pots, occasionally place the pot into a deeper bucket and slowly pour water into the gap between the pot and bucket. Do this until the water level reaches the surface of the medium. Allow to stand for 30 minutes before removing the pot and draining. This is a sure way of achieving both a good flush and removal of any dry areas. *When growing in containers, this can be calculated by increasing the percentage run-off. 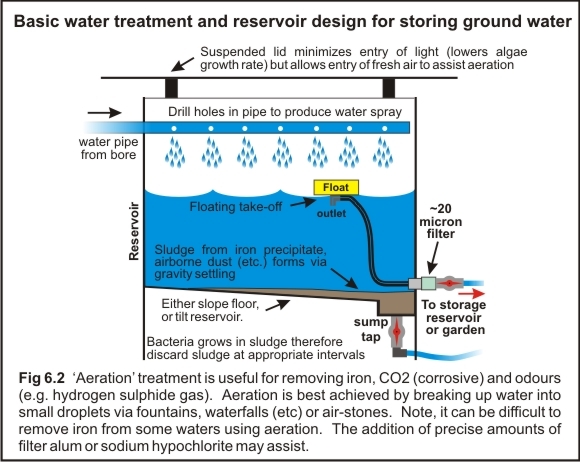 - Recirculating systems: Where the nutrient solution is being recirculated, nuisance salts (e.g. toxic sodium chloride) will accumulate, hence the nutrient solution will need to be frequently discarded and replaced. Build-up occurs when multiple volumes of salty top-up water are added to the reservoir to compensate for transpirational and evaporative losses (Note, when water evaporates, it is essential to understand that all salts are left behind). Thus, the nuisance salt content, and its contribution to the total EC, rises proportionally. Higher EC make-up water needs to be discarded at a greater frequency than lower EC water. The frequency can be reduced by increasing the reservoir volume. As a general rule, provide at least 10 litres (3 Gal) of nutrient solution for each large plant. If the above strategies are insufficient to combat the harmful effect of high EC, the EC can be lowered by blending with a water of lower EC (e.g. rain or RO water), or by using an alternative source (see later section, “water source”). Alternatively, if a recirculating system is being used, the build-up of nuisance salts may be easier to control by switching to a ‘run-to-waste’ system. 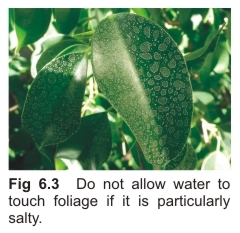 Keep the water off plant foliage if its EC is above ~1.0mS/cm. Otherwise, when the water evaporates the salts will be left behind (Fig 6.3) and cause burning, especially in hot weather. Where sprinklers or sprayers are used avoid those that produce very fine droplets, and schedule waterings for late afternoon or early morning. The use of drippers will prevent the wetting of foliage. Growers can be misled in thinking that a water’s pH reading is a useful gauge for indicating how much acid or alkali is needed to adjust the pH. However, experienced water chemists know that this is not true. For example, it is not uncommon to have 2 different samples of water of equal pH where one requires 4 times more acid than the other to achieve pH adjustment. In fact, this situation can even occur with samples taken at different times from the same source. It is caused by seasonal changes and inconsistency in water treatment at the supplier’s treatment plant. The reason for this phenomenon is the concentrations of “bicarbonate” and “carbon dioxide” present in the water (see sections below) and is particularly pronounced with bore waters. “Alkalinity” is the term used to express the concentration of bicarbonate (or carbonate, if pH is above 8.2) in ‘natural’ or uncontaminated waters. Bicarbonate (HCO3-) is alkaline and therefore elevates pH. High alkalinity make-up water is a major cause of pH increase in nutrient solutions. For this reason, it is necessary to check the pH of the nutrient solution more frequently whenever high alkalinity make-up water is added. Alkalinity is removed by lowering the pH with acid. Alkalinity can confuse growers in their attempt to estimate how much acid will be required to lower pH. Unlike hydroxide ion (i.e. common ingredient for pH Up), bicarbonate is only weakly alkaline and irrespective of how much is present it is unable to elevate pH much above 8.3. Hence, when present at a high concentration it provides a high pH buffering capacity. This means it resists pH change when acid (pH Down) is added. See “carbon dioxide” section below. However, CO2 concentrations above about 0.5mg/L in water are unstable when such waters are exposed to the atmosphere at sea level pressures. Under that condition CO2 in excess of 0.5mg/L will slowly escape from the water and into the atmosphere. This loss of acidity causes a corresponding rise in pH. This is the reason why pH sometimes rises from its minimum value soon after it is lowered. This rise in pH is particularly noticeable with groundwaters (i.e. bore water) having CO2 contents above 50 mg/L. 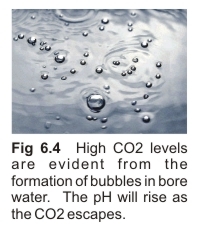 When these waters are pumped to the surface, the pH rises with time because the excess (acidic) CO2 gradually escapes (Fig 6.4). The pH will then rise to a stable value solely dependent on the water's bicarbonate content. For example, uncontaminated bore water with 100 mg/L bicarbonate and 100 mg/L of free CO2 will have an initial pH of 6.3. Its pH will gradually rise to 8.2 after it has been exposed to the atmosphere for sufficient time to allow the CO2 content to drop to around 0.5 mg/L. The same phenomenon occurs with scheme (tap) waters. It is much less pronounced however, due to lower CO2 contents. 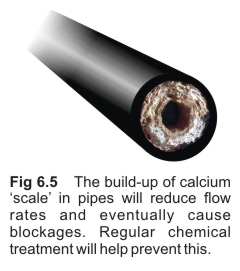 - Use aeration to remove the CO2 prior to use – see Fig 6.2. - Reduce the nutrient solution’s pH to about 5.0 when it is first made, or after top-up water is added. This will provide a much larger pH safety margin than if adjusting to, say, 5.8. Hardness quantifies the combined concentrations of calcium and magnesium. Although these are useful plant nutrients, when hard water is used in recirculating systems, the calcium level may become excessive after several additions of top-up water. This can result in a white precipitate (calcium sulfate) forming in the system. 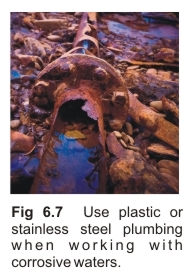 This can cause the blockage of plumbing components such as pipes and drippers (Fig 6.5). It also reduces the amount of available sulfate. This problem can be minimised by using a customised nutrient formula, or by maintaining the pH well below 6.0. “Base exchange” resins are also appropriate for removing hardness. These are now commonly installed in domestic dishwashers. They use a ‘cation’ exchange resin to replace the scale-forming calcium (and magnesium) ions with non scale-forming ‘sodium’ ions. When the resin is exhausted, it can be restored by being flushed with common salt (sodium chloride). High hardness is often associated with waters having high pH. While hardness is not the cause of high pH, the association is due to the fact that hardness and alkalinity (the source of high pH in this instance), typically both originate from the same source - limestone (calcium carbonate) deposits in aquifers. When the limestone is attacked by the CO2 dissolved in rainwater, these deposits are slowly dissolved. This produces both calcium (causes ‘hardness’) and bicarbonate (causes ‘alkalinity’). Precipitates can form when hard water is exposed to the air. To test whether or not this is likely to occur, leave a shallow sample of your water in an open jar for 48 hours. White floating particles are usually an indicator of excessive hardness combined with high alkalinity and high CO2. Although iron is an essential trace element for plant growth, in its natural chemical form it will not form a stable solution in water at pH values above 3, if exposed to the atmosphere. Iron is common in bore or ground water. Water containing iron above ~0.3mg/L can be clear and colorless when first drawn to the surface (Fig 6.6a). However, upon exposure to air, the iron changes to iron oxide which makes the water appear brown and cloudy (Fig 6.6b). Upon standing, the iron oxide often settles to form a brown precipitate (Fig 6.6c). This is a common cause of blocked drippers and brown staining on surfaces that it comes into contact with. Iron should be removed from make-up water prior to use to avoid blockage problems. A simple treatment which sometimes works is oxidation by aeration, followed by 48 hour gravity settling (Fig 6.2). If aeration is unsuccessful, it can be effective to dose the water with a small amount of chlorine**, followed by 5 minutes of gentle agitation then gravity settling. **0.2ml per litre (1/6 tsp per gal) of 50g/L household chlorine bleach. Corrosion of metals will increase with total salt content and acidity (CO2). In natural ‘ground’ waters, CO2 is usually the source of corrosion (see earlier section on CO2). As a general rule, the corrosive nature of these waters becomes accentuated when the total alkalinity is below ~20mg/L. Such low alkalinity is unable to buffer the acidic effect of CO2 if it is present at significant levels. This results in pH values below 5, which are inherently corrosive. Although CO2 can be removed economically (see earlier section on CO2), a salinity problem is much more costly to solve. With corrosive waters, use pumps with stainless steel, ceramic or plastic parts. Use plastic for reservoirs and plumbing. Abnormal levels of other chemicals are often caused by contamination from waste dumps, industrial waste and fertilizer run-off from agriculture into rivers, streams and ground water. Cloudiness is usually a result of suspended clay, iron, or organic matter such as algae. Cloudy water will sometimes turn clear if allowed to settle – a precipitate will form on the bottom. Note that bore water containing iron can be clear when first pumped, but quickly turn cloudy before settling as a precipitate – see section above on “iron”. In the event that the cloudiness remains, precipitation may be induced by adding precise amounts of filter alum (aluminium sulfate) or sodium hypochlorite if caused by iron. However, the downside of using filter alum is that it increases the water’s EC. Failure to remove cloudiness may result in dripper blockages. Also, hydroponically grown plants can be more prone to root borne diseases when turbid water is used. “Color” refers to the color that remains after a water’s turbidity has been removed by filtering, or after being allowed to stand. Color is usually due to organic matter. Its suitability should be tested on a test plot first. Color can be removed by adding precise amounts of filter alum and sodium bicarbonate followed by 5 minutes of gentle agitation then gravity settling (Fig 6.2). “Rotten egg” smell in bore waters and dams is due to hydrogen sulphide gas. 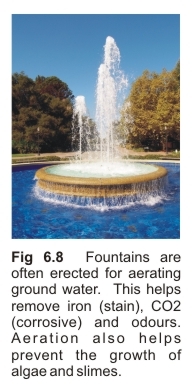 This can be removed by aeration (Fig 6.2). Other odours would generally indicate some form of pollution. In this case the water’s suitability should be verified on a test plot before large scale use. Slimes and algae can cause diseases and blockages of plumbing components such as drippers, filters and pumps. They are also a food source that can be attractive to pests. - Ensure the nutrient solution is not exposed to light. - Be aware that many organic additives (e.g. carbohydrates, sugars) can encourage the growth of slimes. - Stored water and surface waters are a common source of slimes. To overcome problems with these waters see section on “Long term storage of water”. - Routine replacement of recirculating nutrient solution and frequent cleaning of filters will help minimise problems.